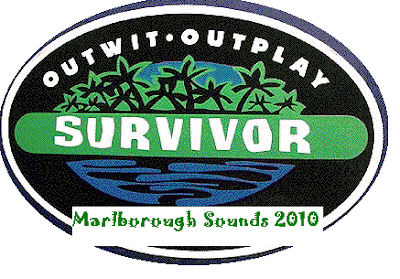 The Life of Brad: January 2010, Marlborough Sounds Survivor! Well as per usual January was full of good times in NZ especially as it is the middle of summer. Unfortunately this year Wellington has not received any summer, but luckily I haven't been there! Instead I have been in Auckland where I had a quick tour of Piha beach and then a visit from my Canadian mate Billy D. His trip took us from beaches in Auckland to adventures in the Marlborough Sounds to an AC/DC concert and finally the Wellington Cup. It was great to speak Canadian for 2 weeks. A quick look at one of the deadliest beaches in NZ, Piha (about 25 minutes from Auckland). Hell, someone even died only 5 days before Brad A. and myself had a trip out there. They also film a TV show called Piha Rescue which deals with mainly people getting tumbled in the washing machine type surf and hopefully not drowning. Since 2000 Piha has had almost 1500 rescues performed by the Surf Rescue teams. Of course the photo doesn't do it justice. Later in the month Billy arrived in Auckland and we spent a few days on the beach in Takapuna. 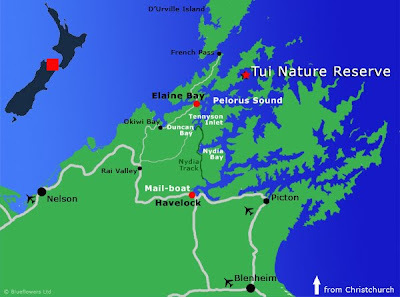 Then it was off to the tip of the South Island and the Marlborough Sounds for Survivor 2010. A good friend of mine Shane Binnie, who once again has another lovely place for all of us to stay, invited myself and others down to the Pelorus Sound where one of his family batches stands in amongst the rare bush of the Marlborough Sounds. 5 days of swimming, exploring, fishing, eating, drinking and all kinds of games was absolutely bliss. Even more amazing is that the batch is only accessible by boat or floater plane. Once we arrived the group was split into two teams so you may notice some green and blue bans in the photos, nothing too serioust. In the end it was just one happy group of us enjoying a pretty good run of weather and a truly rare kiwi experience that even some of the kiwis were virgin to. Trip starting off a bit cushy with bubbles on the plane. I felt like Robin Leach from "Life Styles of the Rich and Famous" knowing people would pay a lot for this trip. Supplies and shuttle to Havelock Harbour. Billy and I on the boat to the batch. Home Sweet Home for 5 days. A panoramic that is always more enjoyed when you click on it and open. The tribes. Me, Joel, Sarah, Hayley, Billy, Woody. Dave, Alex, Jamie, Laura, Tom, Shane. Can't beat this bathroom view. Great day for a tube and a ski. "You know there are stingrays in the water"
For those that enjoy seeing me fail take a look at this video. Once again for those who enjoy seeing me fail (probably more painful than it looks). Curious little guy. Maybe we were keeping him up. Photo by Bill D.
Setting the net for flounder and snapper. Flying home. Wind farms just west of Wellington. The good old "Cake Tin" with ACDC preparations underway. And then there was AC/DC on Thursday, January 28. Brian Johnson (singer, 62), Angus Young (lead guitar, 54), Malcolm Young (guitar, 57), Cliff Williams (bass, 60) and Phil Rudd (drums, 55 and the only one born in Aussie). The old timers continued to put on basically the same show I saw in 1992. A good experience and even better was doing it in NZ. The name is great and needs little space to be displayed. Did ACDC plan the position of the moon that night? Finally on the last weekend of January every year we have the Wellington Cup which always seems to get the best weather. And once again I knew nothing about the bets and still managed to come out a couple bucks ahead for the 3rd straight year. Of course due to the massive queues it is a necessity to bring your own booze. "How to" video. Get action shot from Billy D. I did not win this race, poop. The actual Wellington Cup race. I had bets on Red Ruler and Manonamission and won $70 in total on that race. Not a friend of ours, but a helpful completely smashed picture taker. Thanks drunk chick. 7s is next in Feb! And for those of you who wanted to know more about setting up a batch in the middle of no where. Shane B. takes us through some of the basics for his batch that is less than 10 years old. Great post, stunning pictures man. Keep it up!